With the holidays behind us and taxes on the horizon, many folks are looking to find a qualified financial advisor who is right for their situation. Maybe getting your finances in order was a New Year’s Resolution. Perhaps you’ve realized that retirement is getting closer. Whether you will be looking to work with a financial advisor for the first time or feel that your current advisor isn’t meeting your needs, here are some issues for you to consider in your process of choosing the right financial advisor for your situation. The first question that I ask a perspective client is: What prompted you to seek the services of someone like me? While you may not be totally sure of all of the areas in which you need help, thinking about what you want from a relationship with a financial advisor up-front will help you to find the right advisor for your unique situation. Retirement is looming and I want to make sure that I have everything in order. We inherited some money and want to know how to best invest it. Our investments are all over the place and we have no plan. We want an independent review of our situation and a financial plan to help us move forward. How would you and the advisor interact? What is the advisor’s communication style? How often would you meet? Will the advisor be proactive about bringing relevant ideas and suggestions to your attention? There is no right answer here, but you should be sure to ask about this so that should you enter into a relationship with this advisor your expectations are realistic. Does the advisor work with clients like you? An advisor who focuses on clients who are retired might not be the right advisor for you if you are in your 30s with small children for example. Does the advisor have a minimum level of net worth or investible assets? Where does your situation fall in comparison to these minimums? If, for example, you are a corporate employee seeking advice on how to best manage the stock options granted to you by your employer does the advisor have experience helping clients deal with their stock options? Does the prospect advisor focus on selling financial products? Do they offer financial planning services? Are they compensated on a fee-only basis or do they depend upon commissions from the sale of financial products for all or part of their compensation? It is important that you fully understand how the advisor is compensated so that you understand if there are potential conflicts of interest that might be driving their advice. What are this advisor’s qualifications? There are an increasing number of designations in the financial advice world. The two that hold the most weight as far as financial planning goes are the CFP® designation and PFS designation. The latter is the personal finance designation awarded to CPAs who qualify. Make sure to ask about the designations held by a prospective advisor and also about their education and experience. 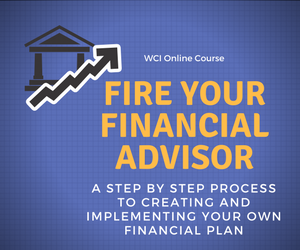 While none of these ensure that the advisor is right for you the answers to these questions will give you a sense of their commitment to gaining the knowledge needed to address your financial planning and advice needs. Check on the prospective advisor’s record. FINRA’s Broker Check database of federally and state registered investment advisers allows you to search by name, and lets you check up on firms as well. Several private services, such as BrightScope, have services to check an adviser’s regulatory record. If the adviser is a Certified Financial Planner you can also look up their information at the CFP Board’s website. None of this is a guarantee, but it is a great starting point. The right financial advisor can help you build the wealth you need to reach your various financial goals. Take the time and put in the effort to select the right advisor for your unique needs. Please contact me with any thoughts or suggestions about anything you’ve read here at The Chicago Financial Planner. Check out our Resources page for links to a variety of tools and services that might be beneficial to you. Would You Meet With Me For $100? Good post Roger! I’ve never personally dealt with an advisor for our assets, but these are all great tips. I can imagine that some may not realize all that goes into a situation like this when in reality you’re really looking for someone that is going to be a good fit for both parties. Thanks for the comment John. Picking a financial advisor takes some work and research, but in the end I think most folks will find the effort worthwhile. What would expect to hear from a financial advisor who has never had a client before? I’m imagining it must be pretty difficult for a new advisor at a firm as he doesn’t have any experience managing assets. Thanks for your comment Marvin. Certainly this can be a tough business for a new advisor. In that case it might be better for them to start with an established firm that might be able to feed him some clients or have her work with some of the firm’s existing clients. If the person is a sales rep in some cases the need to earn a living can cloud their judgement in terms of products offered to a client. Excellent advice. I really appreciate your post. Thanks for your comment Brittanie.